We've skipped volume number 5 to give you a little dash of much-needed fuzz, as #5 was about soft pop. We thought better to keep you wide awake. So what is Freakbeat? Freakbeat was essentially the bridge between the beat groups and psychedelia. It was an adventure, albeit a brief one. Its influence, certainly among musicians, was widespread, although it's only in retrospect that it's been seen as any kind of movement. Usually made by rare British blues and garage rock artists, bands that sounded a bit like the Rolling Stones, Yardbirds, or the Bluesbreakers, but occasionally some of the tougher Merseybeat bands fit this category, too. It was often primitive (indeed, one of the bands was called the Primitives), with a foundation in blues and R&B, but it was a vital cog in moving music forward. 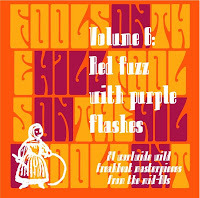 Elements of the freakbeat sound include strong direct drum beats, loud and frenzied guitar riffs, and extreme effects such as: fuzztone, flanging, distortion and compression or phasing on the vocal or drum tracks. Think proto-psychdelia, or how to aim for the charts while stretching the envelope a bit further. Early albums by The Who and The Kinks supplied the blueprints, but The Yardbirds were really the detonators for freakbeat bands that followed, such as The Creation, The Sorrows and The Move. Of course, there were many, many more freakbeat bands than the ones mentioned above. Most of them lasted for one, perhaps two singles, offering three minutes of pure abandon before returning to their regular lives. A fair number of them are commemorated today on compilations, even if they made no impact at the time. Admittedly, we often use this term as a UK-only music, but it does stretch to some Commonwealth countries and Northern Europe who were looking up to Britain for inspiration. The term "freakbeat", incidentally, was coined in the 1980s by Phil Smee of the Bam Caruso reissue label, a man of serious good taste. Tell us about it in the comments section. Very Good Collection,A Lot of Great Songs Thanks! Very nice selection. This is definitely my favorite volume so far. I appreciate the variety and am looking forward to the next batch. Thank you.